Throw your indoor cat a bone (or a tuna steak as it were) this year by building them a summer vacation spot. Since [Travis Brown] lives on a busy street he worries that his cat would get hit by a car if allowed to roam outside. He and a friend found a suitable alternative with this outdoor cat enclosure. The centerpiece of the build is a platform that overlooks the back yard. It’s got a couple of different levels which lets the cat see over the deck railing, and provides a bit of shade from the sun during the day. 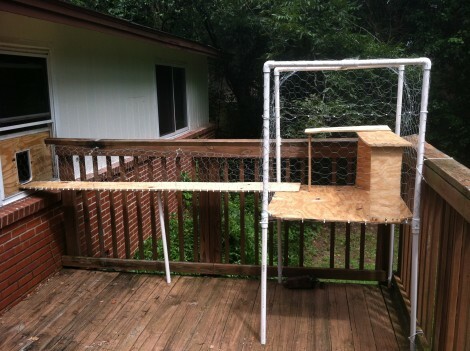 Chicken wire encloses the entire structure to make sure our feline friends don’t go off on their own, but the gang-plank that connects the platform to the house lets them decide when to go outside or come back in. The entrance to the house is an open window covered with plywood and fitted with a cat door. This is a nice touch since the cat door can be locked to keep them in a night. Between this for summer and the heated bed for winter you’re going to have the most spoiled cat on the block.